Tagbilaran is the capital and main city of the Bohol province, in the Bohol island, Philippines. Because of the Tagbilaran Airport, the city is an important way for tourists to start trips through the rest of the island and neighboring islands. The inhabitants of this city are known as tagbilaranons. In 1565, a Spanish explorer named Miguel López de Legazpi came to Bohol looking for spices and gold. He made a peace pact with Datu Sikatuna in a place called Bool, now a district of Tagbilaran. This pact was signed with a blood pact between the two men. On 9 February 1742, the Governor of the Visayas Francisco Antonio Calderon de la Barca separated Tagbilaran from Baclayon and made it a town with the name of San Jose de Tagbilaran and dedicated to St. Joseph the Worker. Since then, it was part of the province of Bohol and became officially a component city (a city that is part of a province) on 1 July 1966 by the Republic Act No. 4660. 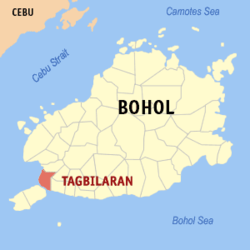 Tagbilaran is in the southwestern part of the island of Bohol, in front of the smaller island of Panglao; between the two islands is the Tagbilaran Strait. The city is 630 km (390 mi) southeast of the national capital of Manila and 72 km (45 mi) south of the regional capital, Cebu City. It has a total area of 36.50 km2 (14.09 sq mi), but the total land area, without the parts that are in the sea, is 32.70 km2 (12.63 sq mi). The coastline is about 13 km (8.1 mi) long. There is a ridge (a long and narrow chain of small hills) with an average altitude of 30 m (98 ft) that runs parallel to the coastline; at both ends of the ridge there are two hills: Elley Hill (100 m [330 ft]) in the north and Banat-I Hill (145 m [476 ft]) in the south. Tagbilaran borders with the municipalities of Cortes (north), Corella (northeast) and Baclayon (east). To the south is the Tagbilaran Strait and the Panglao island, and to the west is the Maribojoc Bay (part of the Cebu Strait). With a population of 96,792, Tagbilaran has a population density of 2,960 inhabitants/km2. Tagbilaran has, like the rest of the Philippines, a tropical climate. The average temperature is high and the humidity is also high. The dry and the wet seasons are very similar. The city of Tagbilaran is divided into 15 barangays (like neighbourhoods). ↑ 1.0 1.1 "Location". City Government of Tagbilaran. Retrieved 16 October 2014. ↑ 2.0 2.1 2.2 "Total Population by Province, City, Municipality and Barangay: as of May 1, 2010" (pdf). 2010 Census of Population and Housing. National Statistics Office. p. 28. Retrieved 16 October 2014. ↑ "History of Bohol". Province of Bohol, Official Website. Retrieved 16 October 2014. ↑ "History". City Government of Tagbilaran. Retrieved 16 October 2014. ↑ "Province: BOHOL". PSGC Interactive. National Statistical Coordination Board. Retrieved 16 October 2014. ↑ "Geography". City Government of Tagbilaran. Retrieved 16 October 2014. Wikimedia Commons has media related to Tagbilaran City. This page was last changed on 14 May 2018, at 15:03.